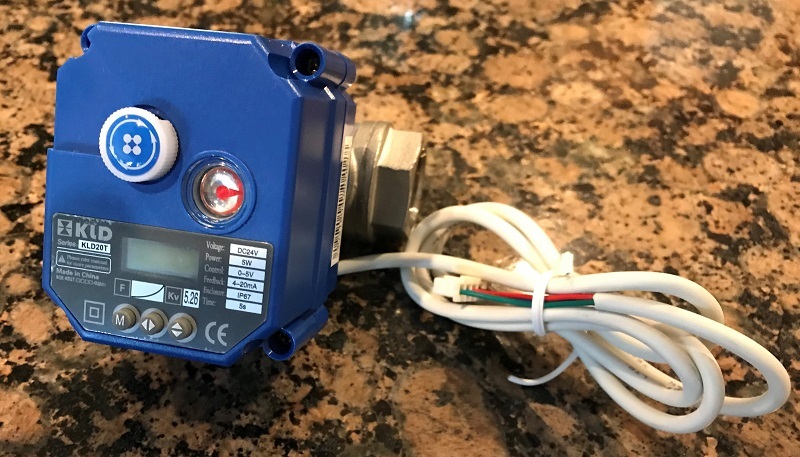 Proportional Valve – This valve is a 2-way motorized ball valve which will open to a percentage which is proportional to an analog input voltage across the range 0 – 5 VDC. 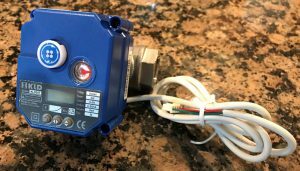 The valve is powered by a 24 VDC source, is IP67 rated (wash-down capable), has an LCD readout for opened angle and setup, has a position indicator, and has a manual adjustment knob. The valve body is full-port 1/2″ NPT, constructed of SS304 with teflon seals. The ball valve is slotted to create linearized flow across the range. The valve has 4 wires: Power (24 VDC), Ground, Control Signal (0-5 VDC), and feedback signal (4-20 mA). Download the specification sheet/manual here. 2-way Valve – This valve is a 2-way motorized ball valve which will open or close depending the input signal. The valve is powered by a 24 VDC source, is IP67 rated (wash-down capable), has a position indicator, and has a manual adjustment knob. The valve body is full-port 1/2″ NPT, constructed of SS304 with teflon seals. The valve has 3 wires: Open (24 VDC), Close (24 VDC), Ground. The valve is appropriately directed via SPDT relay. Download the specification sheet here. 3-way Valve – This valve is a 3-way motorized ball valve in an ‘L’ port configuration. This means it will connect the central port to the left or right ports depending the input signal. The valve is powered by a 24 VDC source, is IP67 rated (wash-down capable), has a position indicator, and has a manual adjustment knob. The valve body is full-port 1/2″ NPT, constructed of SS304 with teflon seals. The valve has 3 wires: Open (24 VDC), Close (24 VDC), Ground. The valve is appropriately directed via SPDT relay. Download the specification sheet here.